Oliver and Felicity Обои. . HD Wallpaper and background images in the Oliver & Felicity club tagged: photo smile19. 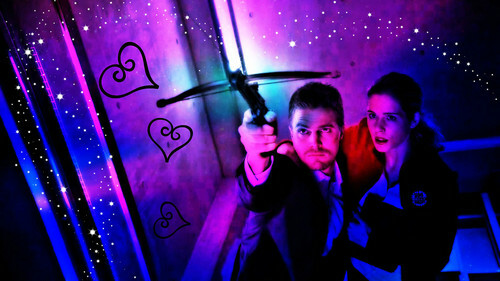 This Oliver & Felicity wallpaper contains концерт. There might also be гитарист. Stephen Amell & Emily Bett Rickards doing commercials for the CW.